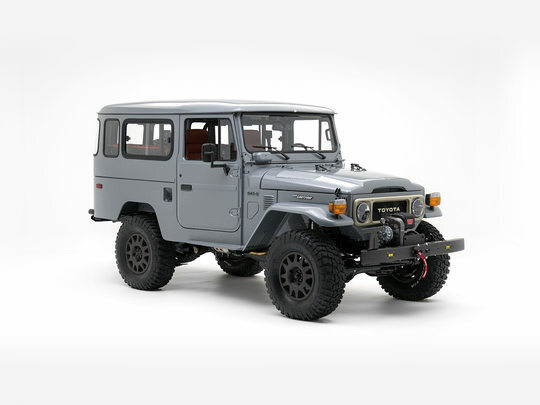 ​1984 ​G43-S - ​Cement​ - ​FJ43-113295. Can a classic 4x4 maintain all the vintage ruggedness we love, be comfortable, and include the upgrades we enjoy in modern cars? Yes! We present exhibit A: the G43-S by The FJ Company. The G43-S is our living tribute to the FJ Land Cruiser. It includes features from Land Cruisers past and present, and represents our commitment to performance and craftsmanship. Oh, and that “S” stands for supercharged – ohhh yeah... so buckle up and get ready to experience the Land Cruiser you’ve been waiting for! This project began, as all of ours do, with the authentic chassis and body of a 1984 FJ43 Land Cruiser, painstakingly restored by our team of craftsman. Much of what you’ll see on the exterior of this vehicle: the OEM emblems, bolts, hooks, and grille stay true to that classic foundation. Even the jerry can and the 70th anniversary M8274 winch by WARN feel like the kind of accessories you’d put on your Land Cruiser back in the day. While this G43-S is a tribute to the past, it has also been infused with a touch of modern flair. Enter The FJ Company's Signature trim: Custom exterior color, aluminum wheels, and bumper-integrated fog lights invoke a rally-inspired design, while the CNC-machined aluminum gas cap, door handles, and side mirrors painted in contrasting Gunmetal Gray feel both custom and vintage. The side mirrors in particular, combine early 60s design elements with the larger dimensions of the late 80’s mirrors. Under the hood, you’ll find 318 horses, ready to let loose. How did we get here? We started with the Toyota 1GR-FE engine and we supercharged it, because well, why not? So if you’re looking for more power and more torque in a classic package, congratulations, you’ve found it. And now, Toyota’s tried-and-true engine can breathe a little easier thanks to an extra set of gills and a throaty TIG-welded stainless steel exhaust. The engine has been mated to a 5-speed manual with spirited shifting and plenty of coast in 5th gear. The G43-S may look like a classic 4x4, but it’s a lot more comfortable to drive. We’ve got a coiled suspension up front, and the king of shocks (yes, KING shocks) - now does our bidding. And, to give you more safety and control in aggressive driving conditions, this build is equipped with electronic stability and traction control, and anti-lock brakes. But of course, if you’re one of those enthusiasts who thinks these modern wonders of engineering impede the driving experience, just hit the OLD SCHOOL button and let ‘er rip. Classic Land Cruisers have character and craftsmanship - the kind you can’t find in modern vehicles. And the cabin of the G43-S is no different. But here, retro features mingle with the modern contours and custom details of our Signature trim - creating a one-of-a-kind interior that’s bold, luxurious, and rugged - all at the same time. With the G43-S, you don’t have to leave the modern world behind, when you get behind the wheel. With wireless Apple CarPlay, you can make calls, get directions, and access your favorite music wherever you are - no cables required. And features that are largely absent from classic cars don’t hesitate to make their presence known here: modern lighting, front and rearview cameras, climate control, and digital displays. The G40 Signature by The FJ Company was designed without compromise. Customize every detail of our most premium Land Cruiser today.